Why Use Eco-friendly Cleaning Products in Your Office? There are seemingly endless cleaning products on the market today. The sad reality is that most conventional cleaning products—soaps, polishes, and disinfectants—as monitored by the Environmental Working Group, are more likely to be cancer-causing or otherwise harmful. Since the 1970s, more than 85,000 new chemicals have been introduced through products! Many of these chemicals are in the janitorial industry. According to the New York Times, unlike pharmaceuticals or pesticides, “industrial chemicals do not have to be tested before they are put on the market.” In fact, since it began in 1970, the Environmental Protection Agency (EPA) has mandated safety testing for only a small percentage of those 85,000 industrial chemicals. Most of us have seen the labels on cleaning supplies warning to store them properly, and keep them away from children so they do not ingest them. 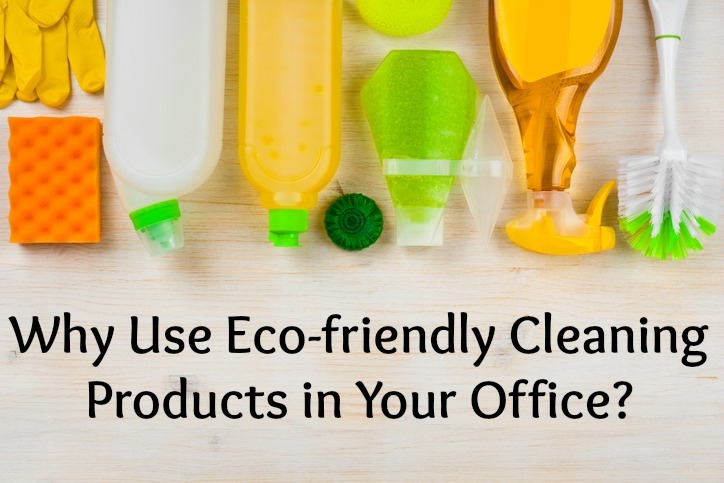 But why use eco-friendly cleaning products in an office of adults? Even if all you are doing is going into a newly cleaned office (most workplaces are cleaned nightly), you are effected by cleaning products, largely through breathing the air. Conventional cleaning products have toxins that are bioaccumulative. That means that over time, little by little, they collect in the body. They do not easily purge from the system, and can add up to toxic levels. Some medical studies suggest a direct correlation between repeated exposure and an increased chance of cancer and other diseases. These can become dangerous indoor pollutants that contribute to headaches, allergic reactions and even chronic respiratory problems. Over time, these types of chemicals can be absorbed into the bloodstream causing long-term health problems like asthma, hormone disruption, and neurotoxicity. The benefits of green cleaning reach beyond the limits of the immediate, and into the future. Of all the volatile organic compounds, the EPA says phosphorus, nitrogen, and ammonia are some of the worst environmental hazards. They are in the environment largely from cleaning supplies. Rinsed down drains and toilets, these three chemicals are not removed by waste treatment processes. They make it through, contaminating waterways in large quantities! Over time, a build up of these chemicals affects plant and water life, and ground soil. As people become more aware of the impact on their health and the environment, the more they want products that will not raise these issues. Being “green” when cleaning is quickly climbing up the priority list for more and more businesses. Eliminating the potential harm that can be done by lingering chemicals helps safeguard employees against health issues. Healthy employees means fewer sick days, which are time and money lost. Since there are no federal regulations of chemicals in traditional cleaning products, using green supplies means a better knowledge of the ingredients. These non-toxic products result in a purer environment and better air quality. A lesser-known added benefit of going green is that it helps the company attain credits toward Leadership in Energy and Environmental Design (LEED) certification. LEED provides criteria for assessing building sustainability. Chicago offers incentives to companies with LEED certification. Most north and west suburbs offer something similar. Here’s an example for DuPage County’s Green Building Incentive. At Beyond the Limits, you choose the products we use for your office. We will explain the pros and cons of all options. We ensure the well-being of our clients with a broad set of cleaning practices that don’t just mean switching one product for another. Our commitment to eco-friendly office cleaning sometimes means extra time and more elbow grease. Cleaning is more than just a job for the staff of Beyond the Limits. It’s a commitment to provide the best services for your maintenance dollar. Give us a call, and let us show you what we can do for you facility. I would recommend them to any Chicago area business. They consistently do a great job in maintaining our entire floor, and react to whatever special requests we throw at them. — Keith B.
We’ve been a happy customer for over 8 years and they always adapt to our needs and schedules, they’re great!— Julia O. Contact us directly to request an estimate or to discuss your specific commercial cleaning needs or building’s requirements. Let us show you why clients who choose Beyond the Limits, always stay with Beyond the Limits.